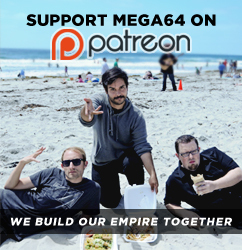 Let it be known that this Podcast featuring The Mega64 Boyz is so impact-full that it will forever change the ways in which people will do Podcasting from here on out. With our discussion on the 2DS, Tiger Electronics, and Fall movies to come, we begin today with a new brighter look at what is to come in the future of the Internet. Please celebrate this new holiday by watching this podcast that changed this world to be forever better.Â Or you may listen to it here, if you so choose. I will leave you this poem I just wrote: Before I leave you for 6 days more, please go to our sweet store. Buy a DVD, Poster, or Shirt..you'll look so good the ladies will flirt. and now with your new girl in tow, you should take her to Gamedays at Disneyland Bro!